It’s one thing for a restaurant to have no reservations. But no seats? My first reaction when I hear about Spoken English, DC’s new standing room only restaurant, approaches horror. I’m not opposed to standing in line to get into a restaurant. Been there, done that. But to dine standing up is another matter. 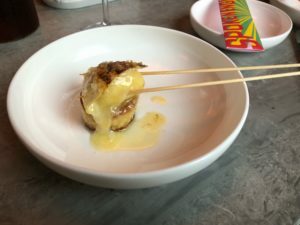 BUT- this is a restaurant from the talented Chef Erik Bruner-Yang, and it’s in the ultra-cool Line Hotel in Adams Morgan, and well-respected chefs James Wozniuk (Maketto) and Matthew Crowley (Komi) are cooking, and the Instagram posts from other restaurant obsessives are captivating. How can I not check it out? I don’t want to be the last one not standing. So, I grab one of my very favorite dining companions, my 23-year-old niece, and head over to the Asian-themed, 15-seat restaurant. By the time I make it to Spoken English, social media has prepared me for the experience. But there are a multitude of surprises still in store. 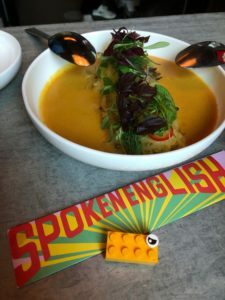 According to the website, “Spoken English brings back the lost art of conversation.” The idea is to make yourself at home and engage with other diners. I am up for this, particularly because in a restaurant setting the natural thing to talk about is food. I’ve got this. On the bright side, this allows us to focus on the cooking, since it’s taking place just a few feet away. The intimate venue promotes plenty of interaction with the staff, which is particularly welcome when the people around you aren’t conversive. Experience aside, memorable cooking needs to be a part of the equation. And it is. The Spoken English menu features kushiyaki (skewered and grilled items), small plates, and large format dishes. Crispy chicken drumettes with Chongqing spice requires a full glass of water as an accompaniment. 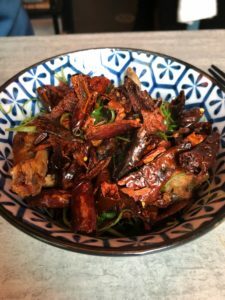 The Szechuan-spiced dish makes your lips tingle like they’ve never tingled before. Dried red chilis dominate, and at some point, you will feel the burn so intensely that you want to give up and move on. I can’t quit this dish, and I dive back in repeatedly. It’s not on the current menu, but I hope it makes a reappearance. A popular dish at Spoken English is fermented durian curry. I’m not versed in the controversies of durian fruit, but I now know that in Southeast Asia it’s known as the “king of fruits.” It is also known for having an unpleasant odor, but fermentation mellows the funk. The durian is mixed with red curry paste and to compliment spaghetti squash topped with mint leaves. It has a subtle sweetness and a pop of heat that resonates. I am captivated by the flavor. 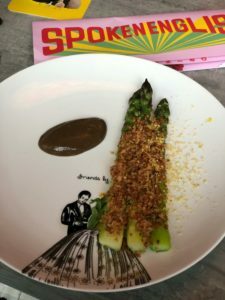 We are also enticed by asparagus with black garlic aioli and licorice, and tender Waygu short rib with anchovy and fresh wasabi. I yearn for whole roast duck, which Tom Sietsema in his Washington Post review refers to as “the showiest prize.” The $98 large format plate is just too much for two people to handle along with all the other dishes, but I’m coming back for you, ducky. 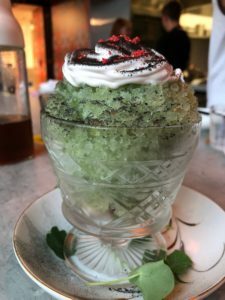 We have placed a dessert order- Japanese shaved ice with tapioca pudding, cherry blossom granita, and black lime powder. But then we notice a woman at the end of our table, and she is ordering all the food. And she is eager to talk to us. She’s raving about a cheese dish, and we are swayed to order the Green Hill Camembert with fermented honey and smoked olive oil on toast. This Japanese version of grilled cheese has me completely besotted. Plus I feel complete, now that I’ve exchanged stories and business cards with a fellow diner. The shaved ice dessert from Pastry Chef Pichet Ong is not my thing, as I want more sugar in my dessert. The sweetness of the cheese dish is fully satisfying as a Spoken English finale. If you can snag one of Ong’s cakes from Brothers and Sisters down the hall, do it. He’s really a terrific pastry chef. I have been standing for the entire meal, and while I envisioned myself suffering through to experience the food, I’ve barely noticed. Spoken English is just that outstanding. Good news: Spoken English is now taking reservations!